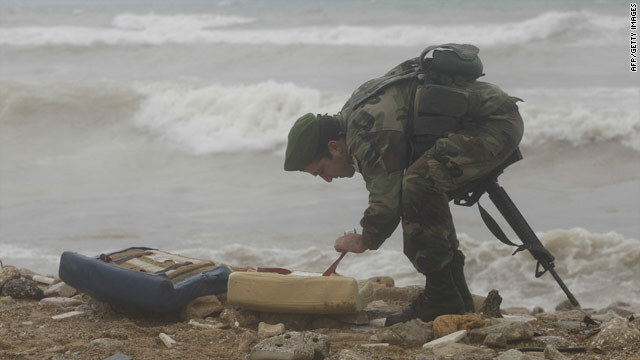 A soldier inspects debris washed up after an airliner crashed off the Lebanese coast. Beirut, Lebanon (CNN) -- British, French and Cypriot aircraft and a U.S. warship joined rescue crews searching the Mediterranean Sea off Lebanon's coast Monday, where an Ethiopian Airlines flight crashed with 90 people aboard. By the afternoon, crews had found 21 bodies but no survivors, a Lebanese military spokesman said. It disappeared from radar a few minutes after takeoff, said Ghazi El Aridi, Lebanon's minister of public works and transportation. Authorities did not immediately know the cause of the crash. "We don't believe that there is any indication for sabotage or foul play," Lebanese President Michel Suleiman said. Fourteen bodies were brought to Beirut Hospital, but only one still had clear facial features, according to Lebanese Health Minister Mohammed Khalife. The bodies were undergoing DNA testing, Khalife said. Prime Minister Saad Hariri announced a day of mourning for the victims of the crash, ordering all government departments to close, the state-run Lebanese National News Agency reported. He praised security forces and the Red Cross for their efforts in the aftermath of the crash. Suleiman, speaking to the National News Agency, said it was a major loss, not only for the victims' families but also for the nation, noting that the passengers included "a group of young men and women who left Lebanon to work abroad and to earn a living and raise the banner of their homeland." The Lebanese government asked American officials for help in recovery efforts, U.S. defense officials said. The U.S. military sent the USS Ramage, a guided missile destroyer, and Navy P-3 aircraft in response, according to the officials. The airline said a 14-member team of investigators was at the scene of the crash. "We want to figure out the reasons behind this plane crash, and we will be very transparent in informing everyone of what happened," Hariri said. The Boeing 737-800 had eight crew members and 82 passengers -- 51 Lebanese nationals, 23 Ethiopians, two Britons and citizens from Iraq, Turkey, Syria, Canada, Russia and France, the airline said. An earlier tally provided by the Lebanese government varied slightly. Among the passengers was the wife of the French ambassador to Lebanon, said Anne Charlotte of the French Embassy. Marla Sanchez Pietton was a native of the United States, the embassy said. The plane crashed about 3.5 kilometers (2.1 miles) west of the town of Na'ameh. Na'ameh is 15 kilometers (9 miles) south of Beirut. As worried family members gathered at the Beirut airport for news, the army and the U.N. Interim Force in Lebanon scoured the crash site for survivors. Government-owned Ethiopian Airlines is one of the largest in Africa. Unlike several African carriers that are not allowed in European airspace because of shoddy safety records, Ethiopian Airlines serves Europe. It serves three other continents as well, for a total of 56 destinations. The airline has such a commendable safety record that some expanding airlines in Asia have lured away its pilots at high pay, The New York Times reported in 2006. The airline has experienced two fatal crashes since 1980. In November 1996, a flight bound for Ivory Coast, also known as Cote D'Ivoire, was hijacked by three men who demanded that the pilot fly to Australia. The pilot attempted an emergency landing near the Comoros Islands off Africa as the plane ran out of fuel, but crashed. About 130 of the 172 people aboard died, according to published reports.